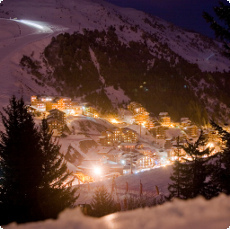 Meribel-Mottaret sits at an altitude of 1700m and is a pleasant little village which benefits from quick lift access to Val Thorens. Featuring more apartment style buildings than Meribel itself, the village still retains a wooden-clad design which is far nicer than in many other 1970s-built ski resorts. Les Allues is a more traditional village set at 1100m. Although small it still has all the local amenities you could need. There is a public bus service linking it with Meribel, and a gondola gives skiers access to all the best runs in the combined area. The combined Meribel area features 15 gondolas and 19 chairlifts which give access to an incredible variety of slopes and terrain within the Three Vallees. Facilities for young skiers are impressive, and the ski area surrounding Meribel benefits from access to a huge amount of off-piste terrain. There are also two decent snowparks, 2 half-pipes and a boarder-cross course. Meribel is one of the first stops on Snowbus shared transfers from Geneva airport - making it the resort with one of the quickest transfer times on our schedule. Buses run regularly providing a cheap and convenient way of getting between Geneva airport and Meribel resort on weekends. There are also shared minibuses running from the valley town of Moutiers to Geneva on Wednesdays and Fridays which means even more low cost travel options to Meribel. Additionally, Snowbus run private taxis between Meribel and Geneva at any time and on any day of the week. We are one of the few companies that are licensed to run minibuses for up to 19 people, so large groups can all travel together. 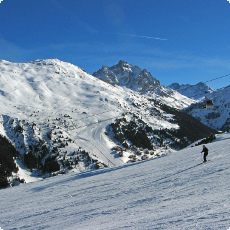 Grenoble airport shared transfers run every Saturday to / from Meribel village. Regular departures from both the airport and resort, comfortable vehicles, and quick transfer times make shared transfers an excellent travel option for small groups and individuals. Snowbus coaches drop and collect passengers from convenient locations in each resort we work with - while seats are sold on an individual basis to make sure you only pay for what you are using. As an alternative for larger groups of holidaymakers, Snowbus also run private taxi transfers in one of our modern minibuses. A private transfer between Chambery airport and Meribel ski resort is one of the quickest journeys that we operate - meaning you can spend more time on the slopes and as little as possible time in a vehicle. Fitting around your flights, minibus taxis ensure a comfortable door-to-door journey for just your group. Snowbus operate a full complement of private transfers between Lyon airport and Meribel - using our fleet of modern, comfortable cars, minibuses and coaches. We can cater for any size group, and have availability on the majority of days throughout the winter ski season.